Finally, there is an ice cream worth screaming for! With flavors like Smoked Milk, and Rosemary Olive Oil with Spicy Cashew Caramel, Catherine Oddenino and Ruthie Vishlitzky’s Luca & Bosco is a culinary delight, specializing in hand-crafted ice cream that transports the ice cream lover to a world of flavors beyond vanilla. The business name was inspired by their adorable dogs; Luca is the name of Catherine’s white Maltese and Bosco is Ruthie’s chocolate Lab. Prior to becoming ice cream extraordinaires, Catherine was in online media and Ruthie worked in city government. It all began two years ago when they felt something was missing in ice cream; Catherine wanted more unusual flavors and toppings, while Ruthie was looking for something not so overly sweet. They started experimenting and eventually got the opportunity to work out of Hot Bread Kitchen, an incubator kitchen (check out our blog post on HBK here). You may have noticed Luca & Bosco scooping it up for eager fans all over NYC, including the Brooklyn Flea and Smorgasburg in Willliamsburg as well as the LES Film Festival and the New Amsterdam Market. Soon, we’ll be able to find them permanently at the Essex Street Market. Their amazing blend of flavors and textures is what makes Luca & Bosco stand out. Currently, there are 50 flavors (and growing!) including Peanut Crack, which according to Catherine, “is a toasted peanut ice cream, rather than using peanut butter, we put toasted peanuts and peanut brittle inside it and so then the brittle starts to melt a little bit but still has a touch of crunch left.” That definitely sounds addictive! Spice Magic, another flavor, is a perfect blend of warm spices and anise liqueur and has been likened to feel like a “warm mink coat.” Crowd favorites include Whiskey Fudge Rebellion and Drunk and Salty Caramel. 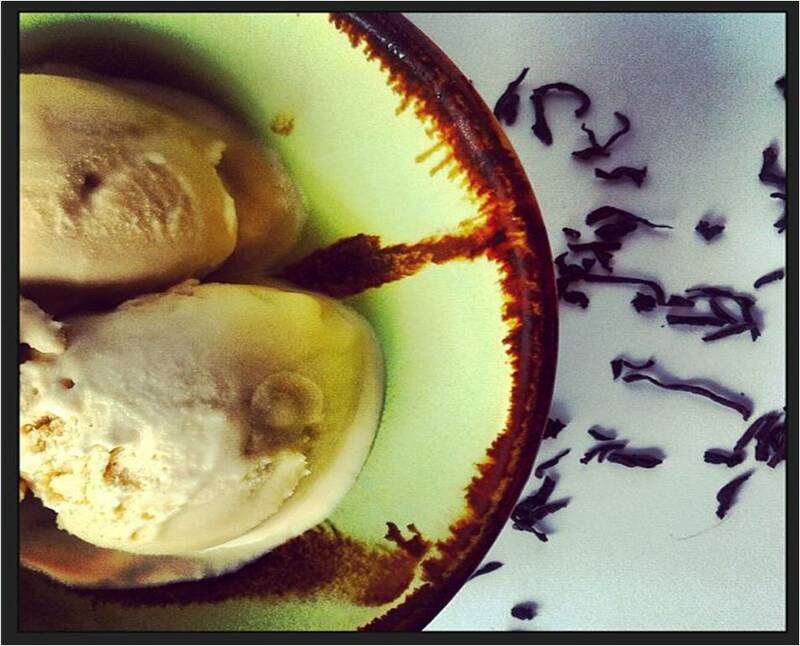 What inspires these Luca & Bosco flavors that are out-of-this-world? Catherine and Ruthie are constantly finding inspiration and ideas from travels, foods, and dining experiences. The Rosemary Olive Oil with Spicy Cashew Caramel flavor came from a spiced nut that Catherine makes for friends every holiday season. Something they get asked frequently is what their favorite flavors are. Catherine is a big fan of bacon (she hosts a bacon party every year! How awesome is that?!) 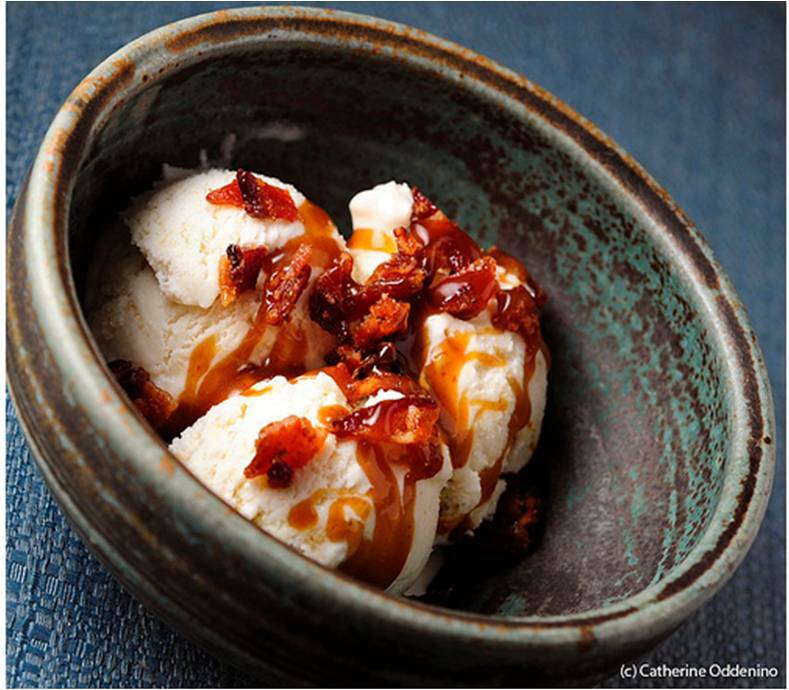 so one of her favorites is Maple Bacon and for Ruthie, Toasted Coconut Vanilla Bean. It’s a really hard question to answer, Catherine says, because each flavor is like a baby they’ve nurtured so they truly love them all. When it comes down to it, for Catherine and Ruthie, it’s all about bringing smiles to people’s faces. When Luca & Bosco opens at Essex Street Market this week, they plan to serve 6-8 rotating flavors to keep people smiling all day long. Their ice creams, toppings and cookies are gluten-free too. Be sure to check them out! We know we will. Next Entry:Is that Pie on your Face?? ?